Interestingly, I wrote this little poem in split lines and then realized it has the syllabics of a "proper" haiku, but I really didn't like how it looked in three lines, so I kept it as I originally wrote it. It reminds me of the second poem I wrote yesterday, over on instagram/ tumblr. 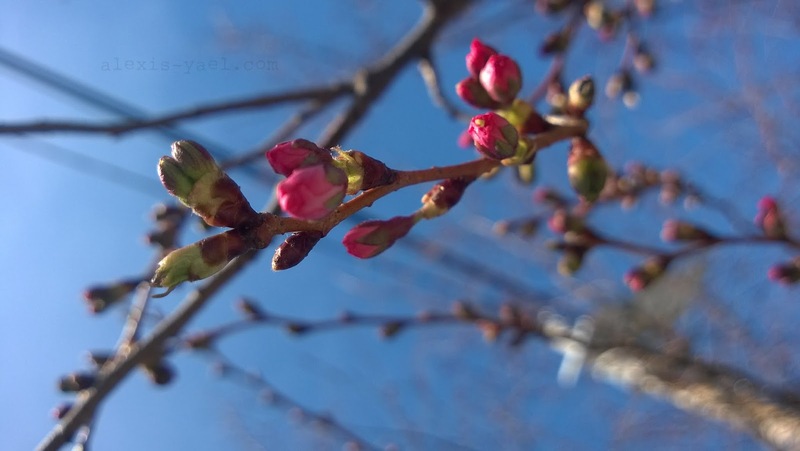 Or maybe it's just that I'm so damn excited that spring is here and the cherry blossoms are this*close to blooming. Sakura season makes me so happy. NaPoWriMo always seems filled with flowers and spring and that's pretty much an April thing. Seasons matter, in haiku, but also so much in my life, right now, living in the east coast. The beginning of this April was filled with "omg, spring better get here soon," because of our cold snap, but that's an April thing, too. I'm just glad it isn't a May thing, like it was when we lived in Toronto. The cherry blossoms are almost here and I'm wearing short sleeves today. And I am not feeling sick, or even particularly hay feverish. Life is good. I'm feeling happy. And even when the cherry blossoms decay (as they will) and I have to go back to wearing layers (which I will) and even on those days when I'm sick, or allergic or even asthmatic, life is still good. Being human, being here - the source of my joy is always inside me. The core of who I am remains. I've worked so hard on remembering that in the depths of winter. It is still something I have to practice. And may always be, because cold - and barren grayness - is difficult for me. Still, I will keep practicing. And to help with that more difficult practice, I will keep practicing now that the externals are to my liking. My joy is in inside me, not because of the flowers that I love, but because it is inside of me. Spring - joy despite flowers. Summer - joy despite green and heat. Fall - joy despite beautiful autumn colors. Winter - joy despite bare branches and cold. Right now, I'll stay swept up in the beauty of sakura, close to bloom, or in bloom, because that is what is happening, all around me. And when the moment passes, I will allow it to pass. And joy will remain. * I use the word joy, because I prefer that English term to the standard translation of the Buddhist term, "upekkha" which is "equanimity." Equanimity sounds too dour to me. Joy as I use it is more like deep inner contentment, not ecstatic happiness. In this way, I am probably more mystical than Buddhist. I am not Buddhist. I am Jewish. I'm an agnostic, mystical (kabbalistic), monist Jew-by-choice who reads an awful lot of Buddhist philosophy, used to be pagan, and was brought up in a Hindu-influenced New Age Christian church.